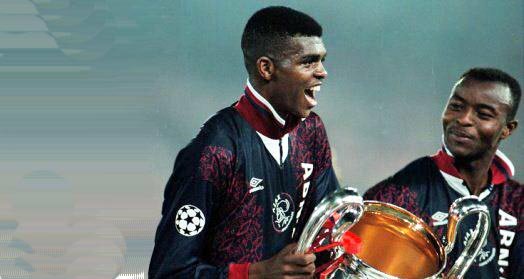 In 1995, Kanu Nwankwo and Finidi George became the first Nigerian to win the UEFA Champions league The duo won it with Ajax Amsterdam of Netherland. Yea I remember that year vividly as if it was yesterday. It was one of the best moment of Kanu in the history of football. look at this small pikin. One young man was asking why we revere him..I told him, he wouldn't understand. To me, that's the player that made realise that one's story can change in a minute. We watched him win in 93 and we saw his Cinderella story unfold before our very eyes. Olympic gold, champions league and then his glorious years at Arsenal. Respect!